The Bobbilicious Files: She said I was Prolific! Last week I was listening to http://ilikeyarnpodcast.blogspot.com/, and Mrs.H said all kinds of nice things about me and my blog! Whee! I've been smiling about it ever since. Of course, she's one of my bestest friends, so that makes it even better. Prolific! Me! I've been a little upset with myself since last night. See, my friend Anna from Knitting up a Storm had a contest. She asked what we would do with $200 knitting money. I screamed yarn. I should have said books. I ache for the Barbara G Walker treasuries. I would also get a couple of EZ's books and the Harmony guides. See, Anna has a pattern called $5 in Paris, a top-down sweater that I'm going to be starting soon. 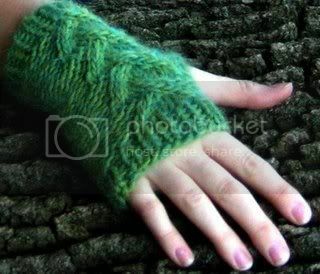 I would love to have the skills to add some personal details like lace panels, cables, or an all-over stitch pattern. Lesson for me: yarn = wrong answer, knowledge = right answer. Like many ravelry members, I have been photographing my stash. There's alot of yarn in my room. I have so much sock yarn, too, and I don't even know how to make socks! Mrs. H said she'd show me, though, and I have a book of crochet sock patterns, so maybe that part of my stash will be used. Some of it is still unknown, like the purple and gold metallic laceweight. I don't wear gold. Maybe something for one of my girls. Maybe it should be moved to the downstairs stash. Yes, I have two stashes! Okay, three - there's a section in the closet, too. Don't worry, I am on medication! Most of my yarn is wonderful. Some of it is from the early days when I didn't know what to look for or how much to get. Seriously, I'm hiding my truest emotion right now: stress. Dad's surgery is on Monday. I'm so worried that I can't see straight. The logical part of my mind (the really small part) tells me that everything will be fine, don't worry, let God take care of everything. The big part of my brain, the really wacked-out part, is screaming in disarray. I have two more days of this. The teacher presents are done. Yay! Dad's blanket is done - one of the kids will be modeling it soon. The above yarn is a bit of prOn for y'all. Isn't it gorgeous? I got it on ebay. It's hand-dyed bucle, cotton or rayon(can't remember), called "vineyard". It's so soft and luscious. What will I do with it? Don't know. Something will come along. See, that's why I need knowledge. 3. I hope your dad's surgery goes great! I'll keep him in my prayers. I'm sure he'll pull it through like it's no biggy! Hey, just give me a holler when you get the stitch markers. I'm always worried about the post office loosing my packages. I hope you love them! ooops....frick. "Knitting in Nature" was my subtitle..but I changed it. lol. I'm such a confusing person!